French “yellow vest” protesters cut off talks with the French government Monday after a weekend of renewed protests and riots, German news service Deutsche Welle reports. French President Emmanuel Macron has held firm on his policies throughout the protests but may be backing off soon. Philippe’s office said favorable “measures” for the yellow vests are coming and Culture Minister Franck Riester promised “a strong conciliatory gesture in the coming days,” according to DW. 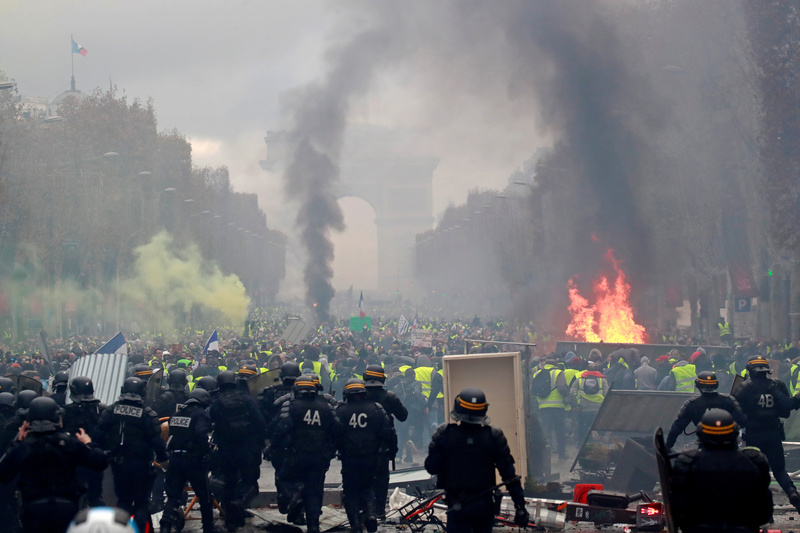 Protesters have grown more agitated at the French government’s seeming unwillingness to yield to any of the protesters’ demands. The yellow vests have called for lower taxes, expanded social programs and other reforms. Protesters have also called for new elections and Macron’s resignation. Riots, property damage and clashes with police have concentrated in Paris. The death toll due to the protests grew to four over the weekend. Three have died after their vehicles hit roadblocks set up by the yellow vests. One 80-year-old lady died after a tear gas canister hit her face as she was trying to close her window to the protests outside, NPR reports. “(Violence) has nothing to do with the peaceful expression of a legitimate anger” and “no cause justifies” attacks on police, Macron said Saturday in Buenos Aires, according to the Associated Press. The protests have lasted for more than two weeks and show no signs of waning. In mid-November, hundreds of thousands of French middle-class citizens marched in protests and blocked streets and highways across France. Macron had recently proposed a new hike in the gas tax hike on top of a January hike that increased gas prices 7.6 cents per liter, or nearly 30 cents per gallon.